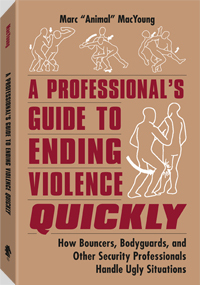 256 pages, 5.5" x 8.5"
People who deal with violence on a daily basis know that the best way to avoid getting injured or sued by the jerk who started the trouble is to defuse the situation or put him down fast and hard. Here Animal shows you how to do both. Marc "Animal" MacYoung knows the ins and outs of American violence. He is the author of many books and has appeared in countless videos on street violence and self-defense for Paladin. Reading his books and watching his videos will save you a lot of hassles and a lot of hurt.